Interestingly, there is another word in Hebrew that also means “pure”, בָּר, and is transliterated “bar,” meaning “pure,” “clean,” and “innocent.” This same word can also mean “grain” or “wheat,” from the root word “barar” meaning “winnowing grain of any kind.” I have shared before how the Bible often makes reference to people as being like plants and that on judgment day God will separate (winnow) the wheat (God’s people) from the chaff (those who have rejected Christ), so it makes sense that these words are closely related! Job is an example of a man in the Bible who had a pure heart, but God allowed his faith to be tested by the devil. Job’s story is important because it shows us that being upright doesn’t mean that we won’t have troubles in this world, or that if someone has troubles they must be hiding a terrible sin, something that was very much believed in Jesus’ day. However, if you know you haven’t been walking rightly and are reaping the consequences in the struggles that have come into your life, God promises that if you go to him with a repentant heart he will hear you and help you. If you will seek God earnestly and plead with the Almighty, if you are pure and upright, even now he will rouse himself on your behalf and restore you to your prosperous state (Job 8:5-6). The only control that we have in this world is in the decisions that we make in the moment and the reasons why we make those decisions, but anything that happens after that is completely out of our control. We can make a good decision in the eyes of other people but can be hiding that we had a wrong reason for doing so, and we can make a bad decision in the eyes of other people but have a perfectly good reason for doing so. God promises that when we stand before him on judgment day, he will be weighing the intentions of our heart. All a person’s ways seem pure to them, but motives are weighed by the Lord. A person may think their own ways are right, but the Lord weighs the heart (Proverbs 16:2, 21:2). For your ways are in full view of the Lord, and he examines all your paths (Proverbs 5:21). What we do in this life will pass through the fire of God’s judgment. Those works that are done with pure intentions will remain and for these we will receive an award, while everything else will be burnt up. Their work will be shown for what it is, because the Day will bring it to light. It will be revealed with fire, and the fire will test the quality [intentions] of each person’s work. If what has been built survives, the builder will receive a reward (1 Corinthians 3:13-14). However, if a person has been saved but their good works are burnt up on judgment day as having been done with unholy intentions, that person will still be saved but will have nothing good to show for their life. This might happen, for example, if someone accepts Christ on their deathbed. If [their work] is burned up, the builder will suffer loss but yet will be saved—even though only as one escaping through the flames (1 Corinthians 3:15). The book of Proverbs has a lot to say about the conduct of the pure of heart as well as the conduct of the wicked. By their fruit you will recognize them… every good tree bears good fruit, but a bad tree bears bad fruit (Matthew 7:16-17). A summary of the book of Proverbs. The pure in heart know that the fear of the Lord leads to life [“fearing” the Lord means to have awe, reverence, thankfulness, love, and, yes, a healthy fear, of our awesome creator]. They trust in the Lord, are patient, rest in content and are untouched by troubles that come upon them. They understand what is right, fully, because they keep God’s commandments and ways in their heart. Because they trust the Lord they act bold as a lion, with strength and dignity. They give thought to their ways and the steps they take. They shun evil and are called innocent and upright. They pursue righteousness and love at all times. They stand by their friends in times of adversity, like a brother. They choose their friends carefully but to those they call friends they are trustworthy. 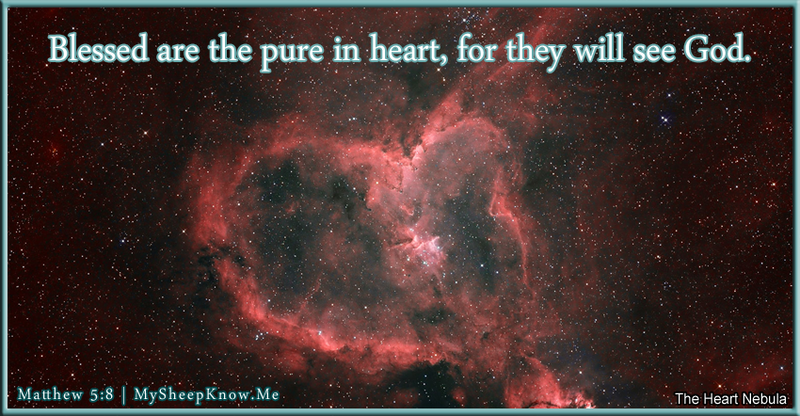 The pure in heart pay attention to the wise. They listen to their parents’ teachings. They love knowledge and wisdom. They pursue wisdom and store up knowledge, though it may cost all they have. In dealings with other people, they are humble and lowly in spirit. If someone more wise then them rebukes them in an unacknowledged sin, they respect the command and heed correction. They confess, and repent or renounce their sin. They love discipline. The pure in heart guard their mouths and hold their tongues in restraint. When they speak, they have a soothing tongue and use gracious words. They are honest; they speak the truth with wisdom and do not seek to deceive. They hate what is false. If called as a witness to a situation, they are truthful. They save lives, turning a person from the snares of death with faithful advice. They are a careful listener and weighs answers carefully before responding. They give without sparing; they are generous. When it is in their power to act and give, they does not withhold their good from people. They are kind to the needy. They do not exploit the poor. They care about justice for the poor. They speak up for those who cannot speak for themselves; they defend the rights of the poor, needy and destitute. The pure in heart are pleasant, peaceful and even-tempered. They have a cheerful, happy and kind heart. If someone is rude to them, they overlook an insult. They promote peace, turning away wrath and calming quarrels with gentle answers. They commit to the Lord whatever work they do. In work they are diligent, their hands are not idle. They honor the Lord with their wealth and offer him the first-fruits of all their work. The pure in heart detest the dishonest and hate bribes. They hate pride and arrogance, evil behavior, and perverse speech. Even so, if their enemy is hungry they give them food to eat and if thirsty they give them water to drink because we are commanded to love our enemies. As for their household, they discipline their children knowing that by doing so they will not be made a willing party to their death. They care for the needs of their animals. They leave an inheritance for their children’s children. The wicked are troublemakers and do not understand what is right. They stir up conflict in the community with gossip that betray a confidence. They generate contempt and disapproval from others. The wicked are chattering fools who blurt out folly, so avoid anyone who talks too much. Their lips bring them strife and are a snare to their very lives; their mouths invite a beating. They use their perverse tongue like a weapon; their teeth are like swords and their jaw is like a set of knives. They use sinful talk and harsh words to stir up anger. They speak rashly and in haste; they are quick to start quarrels. Their lying tongue spreads slander, conceals hatred, and uses flattery as deception. If called as a witness to a situation, they are a false witness who pours out lies; they acquit the guilty and condemn the innocent. They are violent and quick-tempered, showing their annoyance at once in flashes of rage and insolent fury. They give full vent to their rage and their anger stirs up conflict. They lack sense and self-control. They are unfriendly and devious. With deceit in their perverse heart they crave, plot and devise evil and wicked schemes, and in them they find pleasure. They are quick to rush into evil and detest turning away from it. They gloat over the disaster that they create. The wicked are arrogant. Their haughty spirit makes them wise in their own eyes. They lash out with pride and delight in airing their own opinions. They delight in mocking God and foster rebellion against God. They show contempt for the Commandments of God and in his ways. They scoff at making amends for sin. They lack discipline; they despise and spurn all discipline, whether from the Lord or a parent. They hate knowledge and scorn instruction. They do not respond to rebukes and resent correction. They find no pleasure in understanding and remain stiff-necked after many rebukes. They disregard advice received and give deceitful advice to others. The wicked refuse to work because they are lazy, yet they love pleasure and are eager to get rich. They are greedy and constantly crave for more. They go after ill-gotten gains and earn deceptive wages, such as practicing extortion. They oppress the poor and give gifts to the rich, with a flattering tongue, to increase their wealth. They lie in wait to ambush the innocent and shed blood. They plot harm against their neighbors. They sow injustice and cruelly mock the poor, answering harshly those pleading mercy. They bring ruin on their family. They despise their parents. They mock their father as they rob him. They scorn and drive out their aged mother. Their children are left undisciplined. They are envious of others. They commit adultery with another man’s wife and are a companion of prostitutes. The wicked put up a bold front while concealing their sins, paying back evil for good. They do not trust the Lord they trust only in themselves. They hate a person of integrity and detest the upright. We are promised that God “takes note of the house of the wicked and brings [them] to ruin and shame” but for those who “pursue righteousness, love and humility” God promises “life, prosperity, favor and honor” (Proverbs 3:35, 8:35, 21:12, 12:21, 22:4). We are also promised that those who have a pure heart will “see” God. This “seeing” is in an inward sense, perceiving God’s influence and presence through the Holy Spirit. It is this internal stirring from the Holy Spirit that allows us to see and know God in a way that can not be taught and can not be truly shared with another person. But when he, the [Holy] Spirit of truth, comes, he will guide you into all the truth. He will not speak on his own; he will speak only what he hears, and he will tell you what is yet to come. He will glorify me [Jesus] because it is from me that he will receive what he will make known to you (John 16:13-14). While we receive the spiritual sight to “see” God in this life through the Holy Spirit, we also have the promise that we will see Christ face-to-face when he returns to gather his people to him and setup his kingdom here on earth. But we know that when Christ appears, we shall be like him, for we shall see him as he is (1 John 3:2). We also know from the book of Revelation, which came through the Apostle John’s visions of the future while a prisoner of Rome on the island of Patmos, that God promised he would restore Eden to us in the new earth. Then we shall see God clearly and will forever be in his grace.